13 for 2013 - April Finished and Bonuses! My April task was literally done on the first day of the month, but I waited to get a couple of bonus finishes in so I could do one major post instead of two. My April project was to put together a kit I had picked up from Connecting Threads. 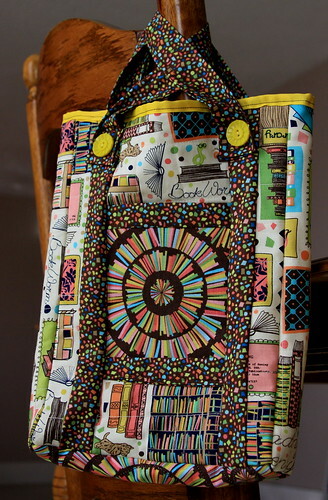 It was a "book tote" done with their uber-cute line of fabric, Bookish by Jenni Calo. Given that I'm in a book club, I thought it would be a nice project for me. I literally made this in four hours from start to finish and am really happy with the result. The only thing I'm going to change when I make it again is to make it 4" wide instead of 2", other than that, it's great. 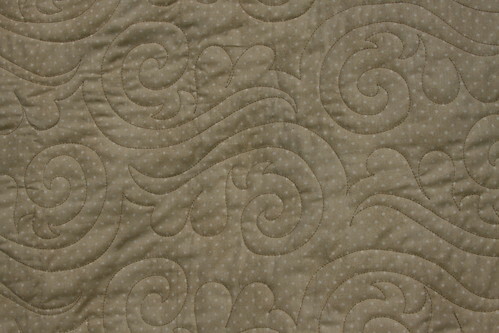 I love this fabric line, but especially the stack swirls. The same fabric is on the front pocket and the back pocket. I love this back pocket. 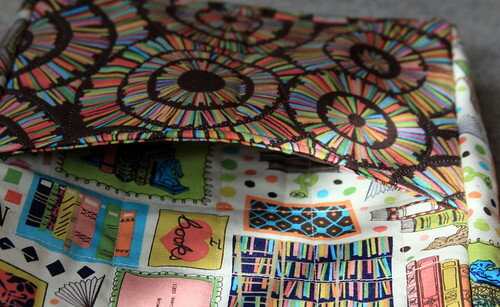 Instead of making binding like I was supposed to, I lazed out and just used some yellow ribbon I had in the craft room. 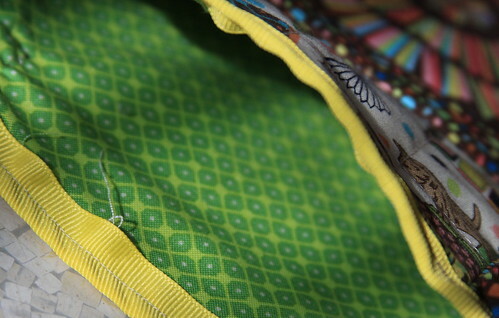 Here's the lovely green lining (and the spare thread I missed before pictures!). April done...and since I was done on the first I waited for a couple of quilts to come back from my quilter. I made the binding before I dropped them (five quilts!) to the quilter, so it was easy to finish these two. First up is a sampler quilt that I finished for a Basics Beginner class I had taken at my local fabric shop, Patricia's Fabric House. I took it just to refine my piecing and to make sure that I hadn't taught myself any bad habits. Although I didn't use all the blocks we had made for the class (I left two out) - I love its size and the fact that it's actually pretty square. 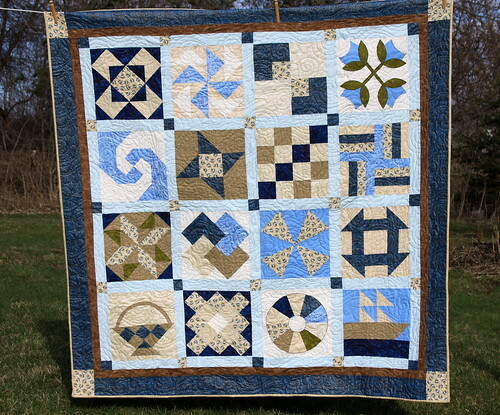 I have to say that I love so many of the blocks in this quilt. 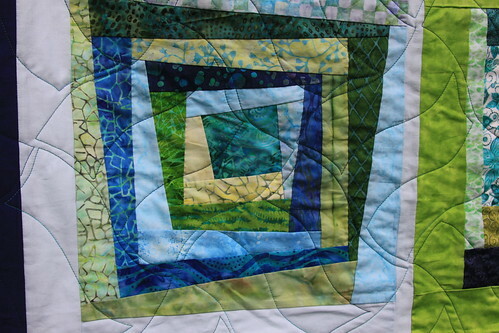 Here's a detail shot of one just to see the quilting a little better. 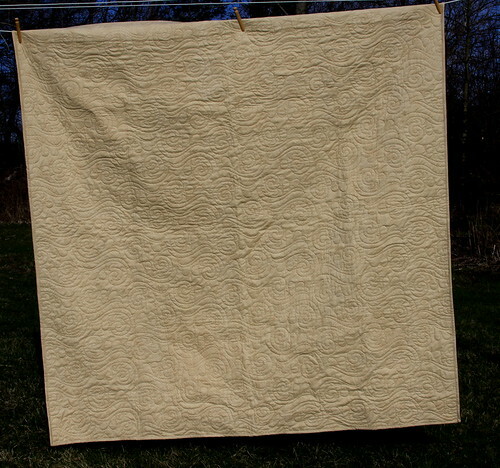 It was quilted with a medium tan thread, which worked perfectly. The back was just this sweet tan with white polka dots, but it really fit so well I decided to use it for the binding too. 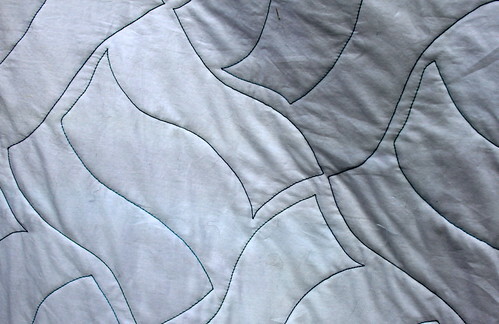 Detail of the quilting pattern. I love how on the front it looks more like waves or wind winding through the blocks, but on the back you can really see the "paisley" aspect of it. Now onto Quilt #2 finished this month. 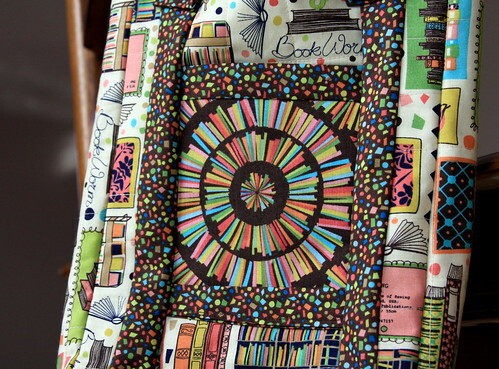 Now, this project was not only part of my "12 for 2012" projects, but it was also the first quilt I put together with the LiveJournal Birthday Blocks Swap (which I now co-moderate). 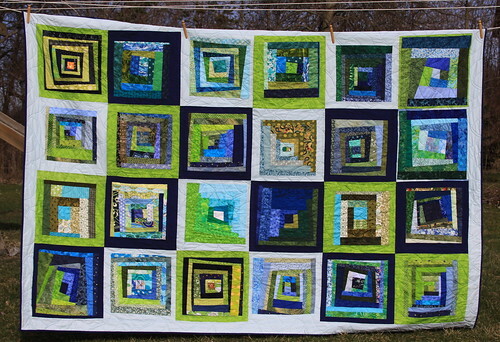 Back in 2010 I asked for 16" "wonky log cabin" blocks in blue and green. I got an awesome selection of blocks! Adding mine in, I ended up with this huge quilt! It is really long, so I had to hang it sideways to get it all in without it dragging on the *very* saturated ground! I had envisioned a more modern, brick-like quilting pattern for this quilt, but my quilter didn't have a pattern that fit and I couldn't find a pantograph that fit my imagination. 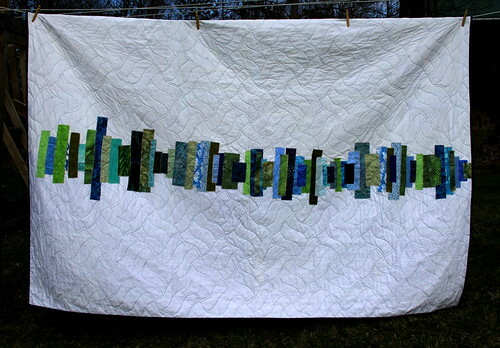 Some day, I'll have a machine that I can do my own quilting on. In the meantime, I settled on this "basketweave" pattern. I think it fits because it is a cross between bricks and waves. At least, that's what I'm telling myself. I had also envisioned the back early on, although if I were to do it all over again, I totally would have strip pieced it, like this patriotic skinny strip. 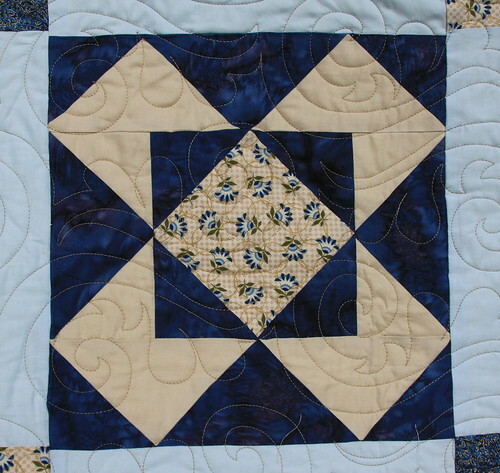 The applique was difficult on my smaller machine and it gave my quilter a little difficulty too. That's it! I can cross this project off of last years 12 for 2012 list! This also means that I am up to date on all of my Birthday Block Swap Quilts - 2010, 2011 and 2012 are all quilted and finished! Wow. I've been really productive. Which is why I signed up for another swap - hit me now! Onto May!